Day 1 of Dolomites Alta Via 2 was different for us than what the suggested staging is. The suggested first day starts from Brixen (or Bressanone in Italian) and ends at Rifugio Bressanone 5½ hours later. It’s all uphill which is fine, but it goes through a ski area which made it less interesting for us. Our original plan was to take a lift up and walk all the way to Schlüterhütte (aka Rifugio Genova) which would be the second night on the suggested staging. 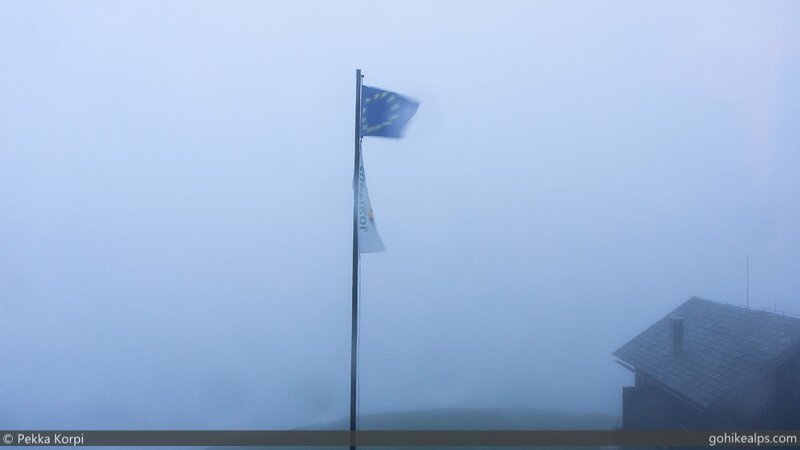 Waking up in Brixen we could not help but notice that it was very, very cloudy and that the weather forecast for the day was flat out terrible. It was going to rain all day. Nevertheless, after a really nice breakfast we decided to go anyway. We were already delayed because of lost bags at Venice International Airport and were eager to get on the mountains. Besides, bad weather is why we have all the Gore-Tex gear anyway. We did decided to make some concessions, though. We had already earlier decided that we would not walk the first part up to Rifugio Bressanone because it just wasn’t appealing to us, mainly because of the ski area. On a pretty day we would miss out on exceptional scenery but since everything was clouded up anyway, that wasn’t an issue. We also wanted to cut down the walking distance a bit since walking on the mountain on narrow paths in heavy rain is tough and not very pleasant. It can be dangerous, too, but we judged from our maps that there would not be any great difficulties on the way and we wanted to make it to Schlüterhütte to catch up on our planned schedule. By the way, if you have a car, make sure you figure out long-term parking before you leave. We arranged to park our rental car in a private facility provided by our hotel. I think we paid 7 or 8€ per day. So, we decided to take a bus. I’m sure any respect I may have had from Alpine purists is now forever lost… Nevertheless, we thought it was a reasonable choice for us on that day. There’s bus connections from Brixen railway station that take you up the mountain to St. Andrea where the base station of the Plose ski area is. That’s where we would have taken the lift up according to our original plan. From there the bus continues to Plancios which is basically on the other side of the Plose mountain, at the other end of the ski area. The bus stopped short of where we thought it was going. This was probably a seasonal thing and I think during the ski season the bus would have gone further. No problem, though, it was a very easy walk of about an hour, hour and a half to Ski Hütte. This, to my understanding, was the name of a lift but also a name for the place itself. In any case, there were a few secluded hotels. 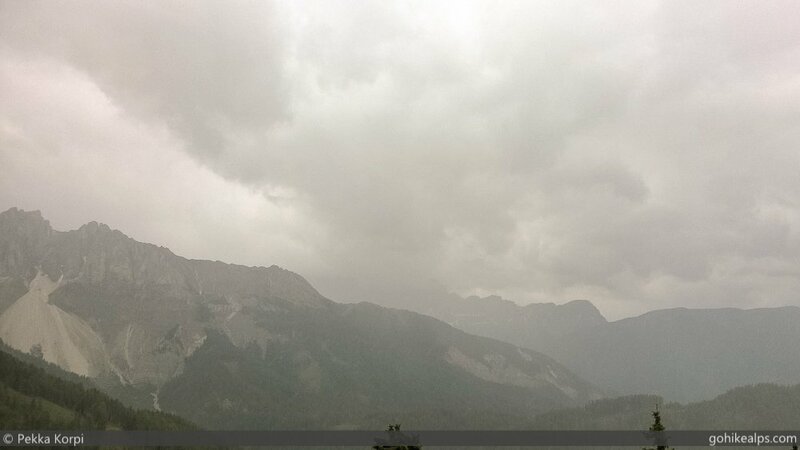 We took a coffee break in one of the hotels at Ski Hütte and that’s when the rain started. From thereon it rained continuously. The next leg of the journey was walking over to Schatzerhütte (or Rifugio Schatzer). We stopped there for lunch and were already completely wet. While eating, we did seriously wonder if it made any sense to continue in the rain. Well, sense or no sense, we decided to continue. Soon after Schatzerhütte we met up with the official Dolomites Alta Via 2 trail which came down from Plose. Thinking back, I’m not really sure if we had saved time or not, it probably would have been fairly close if we had just taken the lift up Plose and walked downhill from there. Then again, if it had been a clearer day we would have chosen differently, as well as, if we had understood the bus would not take us all the way to Ski Hütte. The latter was, of course, my oversight so no one to blame. Now continuing on the official Alta Via 2, the trail comes down to a road at Passo Rodella. There’s places to stop here if you need a break. You need to walk on the road for a while, and then some time on a trail parallel to it. Eventually you go across, back on the proper trail. From there the trail starts climbing up towards Peitlerscharte (Forcella di Putia) and that’s also where you enter the Parco Naturale Puez Odle. This is, in my opinion, where the best parts of Dolomites Alta Via 2 begin. Once on Petlerscharte / Forcella di Putia, you will have an option to climb up the Peitlerkofel (Sass de Putia), the northernmost summit in the Dolomites. Unfortunately for us, this was not an option due to the weather but on a nice day we would have done it for sure. From what I read, this would not have been a difficult climb, and there are cable secured portions (Via Ferrata) in the most exposed parts. The views are supposed to be exceptional and apparently you can see over 400 church spires from there. This is also a very popular climb so I’m guessing in the high season it can get crowded, especially on weekends. It’s a very easy walk from Peitlerscharte (Forcella di Putia) to Schlüterhütte (Rifugio Genova). 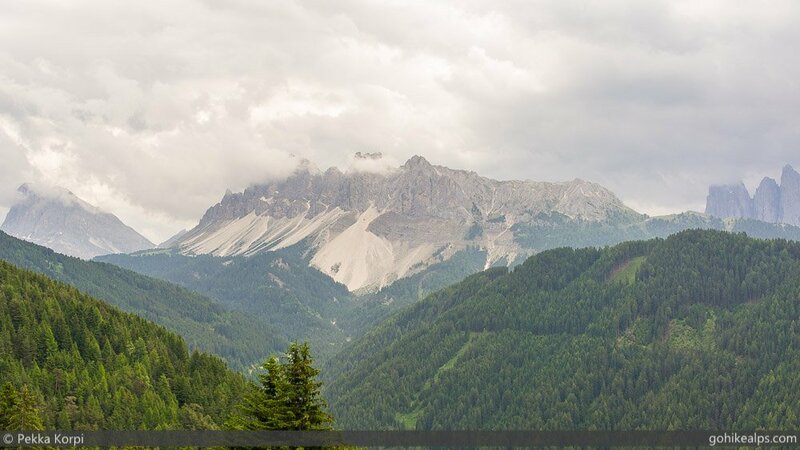 There would have been beautiful south to Val Badia and the Puez-Odle massif but we saw none of it. It just continued to rain, the entire mountain was covered in clouds and there was literally nothing to see but the trail ahead. Even though our outer layers probably kept most of the rain out, the climb up to Forcella di Putia was substantial and we were soaked from sweating alone. Even though Gore Tex breathes, there’s only so much it can do when you’re really at it. Finally seeing Schlüterhütte / Rifugio Genova was a truly joyous moment. We were given a private room and there was a chance to take a very welcome warm shower. After showering, drying up and warming up, a hot dinner accompanied with wine was beyond comparison. There was no need to wait for sleep. One cannot choose the weather and today luck was not on our side. When out there, you take what you get and in our case it was a lot of rain. The day was a good reminder about the importance of proper clothing. You just need to have proper gear and layers in the mountains, there’s no way around it. The conditions were also a little tricky in that even though it rained and we were up in the mountains, it was not particularly cold. You don’t want to have too much clothing on, either, since you’ll be sweating anyway. In these conditions I normally only wear long-sleeved underwear under my Gore-Tex outer layers. I find this to be a fairly comfortable compromise since the long-sleeved underwear is against your skin and not the sometimes sticky outer layer – but you’re still not getting too hot with mid layers. That’s just my opinion, of course, but works for me. Multi Day Hiking Gear. Click here for the Ultimate Packing Guide for the Alps! Day 3: Passo Gardena to Passo Pordoi – Whiteout!